When the Romans came to this sceptered isle – they though it was dreadful becuase of its non-stop rainy weather. A bit different to Italy! Their Senators had already declared the UK as 'The Isle of Honey'. One of the most important being Borage Honey. It was called 'Happy Honey' as they believed that Borage herb and Borage honey increased the blood flow to the brain. Hence the Roman foot soldiers looked forward to their ration of Borage Honey. 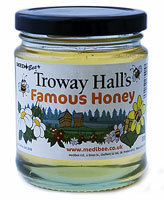 It is clear and fragrent and the lightest and purest of the honey types. Tell us what you think about it.